We want to ensure you have full access to your accounts through our eBranch at all times. So here are some tips and helps that may be useful if you’re having trouble accessing our website or the eBranch. Use the most updated version of their preferred browser. Add our site to your whitelists if you use an ad blocker. Update “InPrivate,” “Incognito” and similar privacy browser settings that will prevent you from logging in to access your account information. Q: Can I get the MyMobile App on my iPad? Yes. While we don’t have an official iPad app, you can download the iPhone version and it will work without any loss in functionality. 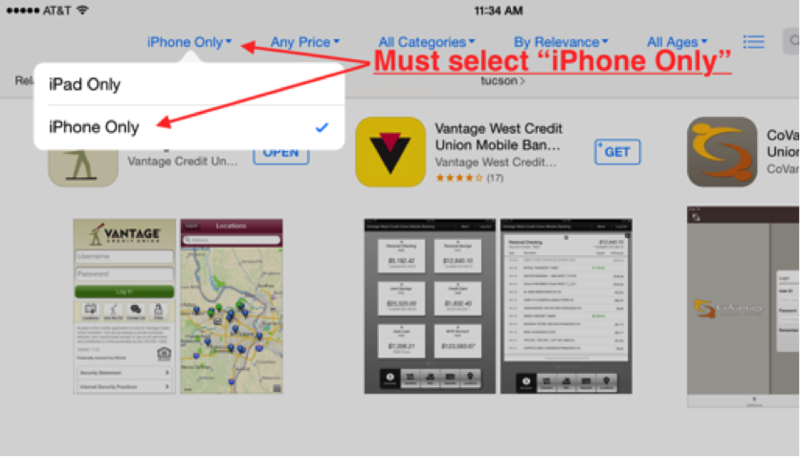 On the search screen, change the search scope to “iPhone Only” and then search for Vantage Credit Union. Download the app and login to your accounts. Q: How do I reset my browser to factory default? Click the Tools icon (gear) in the top right corner of the browser. When Internet Explorer finishes applying default settings, click Close, and then click OK. You’ll need to restart your PC for these changes to take effect. Click the Menu icon on the browser toolbar in the top right corner. Select Settings in the drop down menu. Select Reset browser settings at the bottom of the page. Select Reset in the confirmation pop-up window. From the Help menu click Troubleshooting Information. Click on Safety, then Delete browsing history. Note: If you have the Menu bar enabled along the top of your screen, you can simply click Tools and then Delete Browsing History. In the Delete Browsing History window that appears, uncheck all options except the two labeled Temporary Internet files and Cookies. Make sure to uncheck Preserve Favorites website data. The Delete Browsing History window will disappear and you may notice your mouse icon go busy for a few moments. As soon as your cursor returns to normal, or you notice the “finished deleting” message at the bottom of the screen, consider your temporary internet files and cookies deleted. Select Tools or More Tools, then select Clear Browsing Data. In the dialog box that appears, select the types of information that you want to remove (cookies and cache recommended). Use the drop down menu at the top to select the amount of data that you want to delete. Choose from the past hour for recent history up to beginning of time if you want to delete everything. Select Options and choose the Advanced panel. Q: How do I turn off private browsing? Click on the word PRIVATE in the upper right of your search bar. Click Yes in the pop-up box to confirm. Open Safari, then tap the pages open icon on the bottom right. Tap Private on the bottom left to turn private browsing off. Open Safari, tap the + sign to open a new tab. Tap the word Private on the bottom left of the screen to turn it off. Toggle Private browsing mode Off. When prompted choose to close all open tabs. Q: How do I add vcu.com as a trusted site? Choose the Security tab, then Trusted sites, and click Sites. Type www.vcu.com into the text box, then click Add. Click Close in the pop-up box, then click OK.
Click Change proxy settings (under Network). Select the Security Tab, Then Trusted Sites, then click Sites. Choose Security, then click Exceptions. Click Close on the pop-up box, then click OK.